So, what is Bootstrapper? Bootstrapper is the class, which is responsible for initializing our application. Now question is what to initialize? So, the first thing is to initialize is the Core Services and then the Application Specific Services. Application Specific Services: Apart from core services, Prism also initializes some application-specific services. These are the services, which are specific to our application and which is common among all application modules. For example, if you are working on RSS type application, in that case, RSS Feed service will be application-specific service, which will be used by almost all the modules to read the feeds. Bootstrapper is the very important class, which gives us control of every component, application gets wired up. Prism library provides a default abstract Bootstrapper base class, that has number of virtual methods. Let's go ahead and take a look a Bootstrapper process. Keep in mind that most of the stages of this process will be covered in more detail in subsequent articles. Please keep in mind that we need not to implement each and every single stage. Here I am going to talk about the role of Regions in any Prism application. Here we will discuss, what Regions are and what role they play in our application. We will also look into RegionManager and how it manages our Prism application. 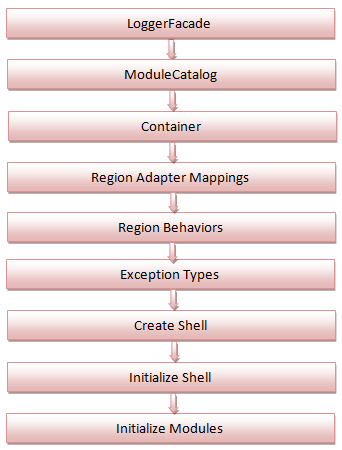 We will also touch upon RegionAdapter and the relationship between Region and RegionManager. Then we will see, how to create a custom region as it is necessary for the controls, which Prism doesn't support. A Region is simply a placeholder for any dynamic content, which is going to be presented in our UI. Regions are similar to the ASP.NET's content placeholders. It is simply a named location, that one can use to define, where our View will appear. I hope, you remember, we talked about the concept of the Shell earlier and how the Shell can contain Regions, where we will inject our Views into. Now let's take an example quickly. In this example, we will have MenuBar Region and a Content Region. These regions define areas of the UI, where our View is going to be injected. Each Region should be explicitly named and describe the type of content in which we are going to inject the Region. So, given a Module with a two views named MenuBar View and Content View. These views will be injected to their respective regions. It means, each Region will have it's corresponding View. Here MenuBar View will be injected to MenuBar Region and Content View will be injected to Content Region. Now, keep in mind, that we just don't have to be in the Shell as Region can also be defined in another View. Regions have no knowledge of Views. We can locate content to a Region, without exact knowledge of how and where the Region is defined. This allows the layout change without effecting the Views in the Module. 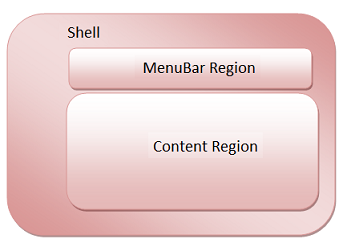 Eg; In above figure, we can shift 'MenuBar Region' to left of 'Content Region', but our 'MenuBar view' will be injected to 'MenuBar Region' and 'Content View', will be still placed into 'Content Region'. So, in this way, we are able to re-design our Shell, without having to re-code any type of infrastructure code. Regions can be created in code or in XAML. One thing, which we need to keep in mind id, Region is not a control, but is a host control and it always implements a IRegion interface. This is important to know as it will be used, when you will programmatic access your Region. I hope, as many of you have probably guessed that a Region Manager is responsible for managing the Regions in the application. It does this, by maintaining the collection of regions. It also provides a RegionName property. This is actually an attached property, that is used to create Regions by applying it, to the host control and this can be again done through XAML or through code. Region Manager also maps RegionAdapter to controls. Now, RegionAdapter is responsible for associating a Region with the host control. In order to expose, UI control as a Region, it must have a RegionAdapter and each RegionAdapter adapts a specific type of UI control. Now, if Prism provided RegionAdapter, doesn't meet our need, we can definitely create our own. Region Manager also provides a RegionContext attached property. This property is similar to the concept of DataContext. It is a technique to share a data between a parent view and a child view. RegionContext can also be set form the code or from XAML. Just watch my next article of this series, here.